It looks like a rifle large enough to part a meteor, sink a battleship, or down a MIG with one shot. The reason is, it’s actually a shotgun, which explains the huge barrel but not the action. Yes, it has a bolt-action, and Mossberg has been the master of these oddball guns for decades. Untold thousands of Gew 98 German Mausers were re-purposed after WWI. Many were converted into early bolt action shotguns. In the 19th Century, most shotguns were break action single or double barrel type jobs. Towards the end that century the first pump and lever-action, repeaters came on the market but the newest rifle designs of the early 1900s were bolt-action rifles with detachable box magazines. After World War 1, several Model Gew 98 German Mausers were converted to fire shotgun shells and these became seen as a very modern idea for a very modern age. Oscar Mossberg, a shrewd engineer and businessman, decided to jump on this concept with both feet and introduce a new shotgun designed from the ground-up as a bolt-action. 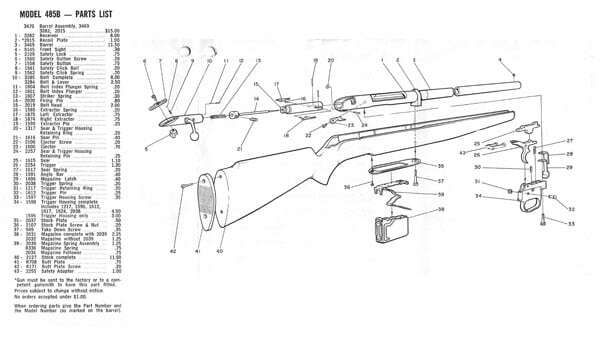 The bolt action Mossbergs were all quite simple in design… not unlike any bolt action long gun. 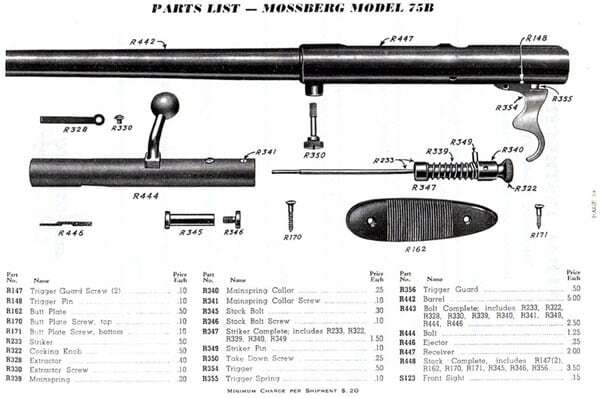 Exploded parts list on early model Mossberg bolt action shotgun. Starting in the early 1930s, he came up with his prototype bolt action shotguns. The gun, fundamentally just a large chambered smoothbore rifle with a turn bolt action set into a one-piece stock, was very simple. In all it contained just over 40 parts and could be made cheaply since the steel of the barrel could be soft due to the low pressures of shotgun shells. Unlike many early pump-action guns that could bind up, the bolt provided almost no chance of failure to feed or eject. Overall, the new design could be a solid challenger during the Great Depression against the more expensive Winchester Model 12 and the Remington 31 pump guns. 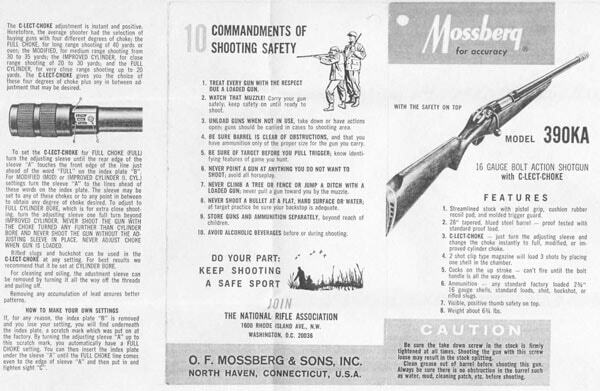 Mossberg’s original 1930s advertisement announcing the first bolt action shotguns. 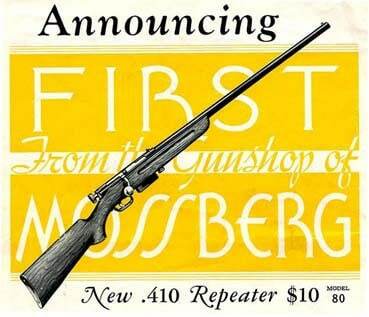 The first bolt action Mossberg to hit the market was the 1933-era .410 Model G Bolt Action Repeater. This four shot rabbit and squirrel gun weighed but 5.5-pounds and used a 26-inch barrel that worked with pretty swag chrome plated bolt lever and trigger. This gun spawned the Model 70 (no relation to Winchester’s rifle of the same designation), a handy little 4.75-pound takedown single shot that could be broken down into two short pieces, each about two feet long, for transport. By 1939 the same design had been produced in 20-gauge as the Model 75. By the start of World War Two in 1941, there were nearly a dozen models and subvariants of the .410 and 20-gauge bolt gun in Mossberg’s catalog. Wartime production of military weapons halted the line and killed the concept for the rest of the decade. Mossberg Model 75 20-gauge bolt action shotgun. A 1960s Model 390 advertisement detailing C-Lect-Choke. After World War 2, thousands of military surplus Winchester, Remington, Ithaca and Stevens pump-action shotguns were glutting the civilian market. These guns, shed by a shrinking military that did not need them to fight Germans, Japanese, or Italians, swamped the gun shelves for a generation. Trying to reenter the fray of peacetime scatterguns for the hunting market, Mossberg redesigned their whole line of bolt-action guns, going from double digit model numbers (e.g. 73, 65, 85) to triple digit numbers (173, 183). These could be considered the 2nd Gen of OFM’s bolt-action shotguns. Many of the 300 series OFM bolt guns used the C-LECT-CHOKE. This choke was attached to the barrel and could be adjusted from modified to full. For a time Mossberg tried to move away from their legacy designs and get into the competition for pump action guns. In fact, their Model 200 slide action, introduced in 1955, was the company’s first venture into a scattergun that wasn’t a bolt action. The thing is, people still remembered the pre-war bolt guns, which had a good reputation among hunters, and asked the company for more. This kept their Model .410-gauge Model 183s and 20-gauge Model 185s in production throughout the Fifties and Sixties. To further expand the line and take advantage of the popularity of the 16-gauge (which was the most popular shotgun caliber in the country for about 30 years), they introduced the Model 190 in 16-gauge and then the Model 195 in 12 at the same time. Mossberg Model 190 bolt action shotgun in 16-gauge. Mossberg Model 190, close up of bolt. Overall, these Mossberg bolt guns were country simple, priced right, and effective. Other ‘value’ makers such as Marlin Firearms even jumped on the bolt shotgun bandwagon in the 1950s with their Model 55 series. They had to get in line behind Stevens and Harrington and Richardson who had been following Mossberg’s bolt-action guns with their own since the 30s. Mossberg C-Lect-Chokes for bolt-action shotguns. Adding factory recoil pads, variable C-Lect-Chokes attached to the muzzle, cross bolt safeties, and sling swivels, Mossberg took their 100-series guns and upgraded the line in the late 1960s to the new Model 385/390/395 designations. By 1974, the company stopped making 16-gauges, the first victim of yesteryear. I myself owned a 12-gauge M395K as a kid 20 years ago and (stupidly) decided to bang out some Olin 12-gauge rescue flares out of it—which didn’t work too well. Needless to say, do not shoot flares out of a regular shotgun. Moreover, do not show my dad this article. By the 1980s, these morphed into the Models 585/595 with stretched 3-inch chambers and improved bolts. The Mossberg 695 was the end of the line for their bolt action shotguns. The last and most modern ‘5th Generation’ of Mossberg bolt action was the Model 695. These guns have been around since 1995 but were quietly discontinued in 2003, ending the exactly 70-year run of bolt shotguns for OFM. Instead of inexpensive guns meant for the everyman, these 695s were niche shotguns. 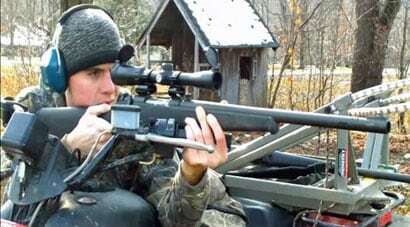 One model was a rifled slug gun with a 22″ fully rifled ported barrel, adjustable fiber optic sights, and Weaver scope bases. The other was a gobbler gun equipped with a camo synthetic stock and a 22′ Accu-choke barrel with extra-full turkey tube to reach out and make those pinpoint shots on Mr. Tom. The 695 slugger is still very well regarded among 12-gauge slug hunters. 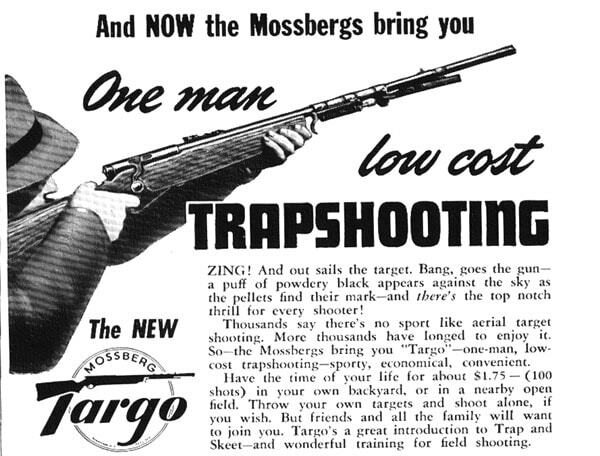 Many Mossberg bolt action shotguns were sold with trap shooting systems. This took the form of a simple clay thrower attached to the barrel. The thousands of Mossberg bolt-action shotguns produced between 1933-1995 can be bought for a song. Fortunately (or unfortunately as the case may be) these older guns, while vintage in many cases, just aren’t that collectable. 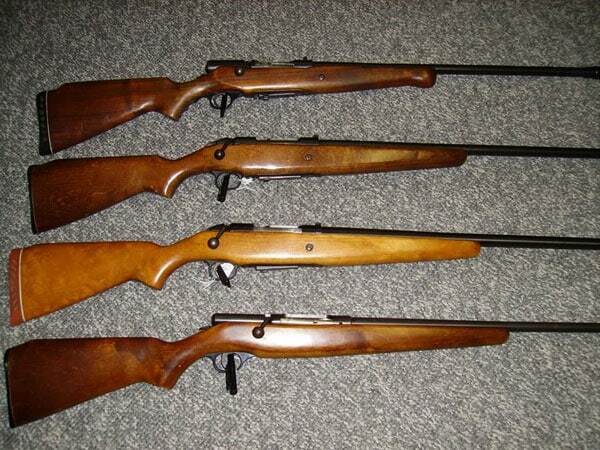 Both Peterson and Fjestad list all of the bolt action Mossbergs (except for the newer Model 695) at between $45-$125 depending on condition. Keep in mind that this price is for working models. 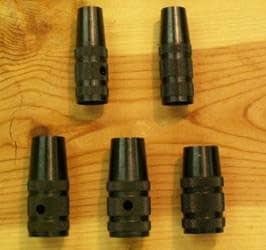 While spare parts are around through Numrich and others, be shy of guns without functional magazines as they usually run $40-ish and can seem like a ‘no-brainer’ purchase. Still if you come across one that works at a good price and need a swamp gun or boat gun that you aren’t afraid if it gets a little rusty, crusty, or lost, you would be hard pressed not to give it a shot (pun intended). Mossberg bolt action rifles, shown here in .410, are a common sight throughout the country in a plethora of calibers. When getting into a more modern 695, be aware that there was a voluntary recall on some of these guns due to a problem with the bolt. The 695s under recall were produced in 1995 and 1996, with serial numbers ranging from M000101 to M015304. Used 695s pop up in the $275 range with both slugsters and Tom callers eagerly seeking them out. 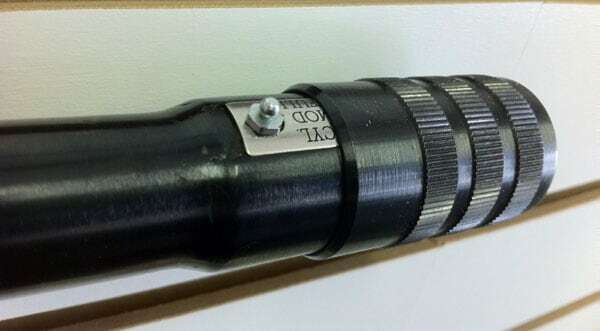 Perhaps bolts were better left on rifles, but don’t tell that to those who own one of these ‘old reliables’. I still have mine. And I know better than to shoot flares out of it now.